TOPEKA — Mary Louise Totten has fond memories of growing up in Kansas City, Kansas, in the 1970s. Those memories include summers spent selling dandelion necklaces and painted rocks to earn money for the ice cream truck and of Father Cyprian Nordhus, a Benedictine who lived at the St. Joseph-St. Benedict Church rectory with fellow Benedictines Father Ambrose Keating and Father Basil Finken. Totten said it was only the white collar on his black shirt that gave him away as a priest. What those bags actually contained were almost magical, however. They were full of empty plastic bottles, pieces of wood, carving tools and an assortment of other materials. Those creations included crosses cut from old plastic bottles with curtain hooks added so they could be hung in a youngster’s room and holy water fonts made from old detergent bottles that Father Cyprian also filled with holy water. Totten noted that Father Cyprian would work with the youngsters for about a half-hour and then collect all of the materials so they could work on the projects later or he would finish them at the rectory. To this day, Totten has no idea how he managed to remember all of the children’s projects or on what blocks they lived. But now as a first-grade teacher at Mater Dei School in Topeka, Totten wanted her pupils to experience some of those same memories. So she enlisted the aid of Father John Pilcher, pastor of the parish. “When the children in the neighborhood would see Father Cyprian coming,” Totten said, “they would shout his name and go running toward him to see what projects he had in his bags. “I always want to be involved with the school so I know what’s going on and can be a resource for them,” said Father Pilcher. But lately, he has been seen quite a lot in the school and especially in Totten’s classroom, often wielding a glue gun as he helps the students with a variety of art projects. “This year, Father John came to my classroom and helped the students build boats out of popsicle sticks when they were learning the story ‘Jesus Calls the Apostles,’” Totten explained. 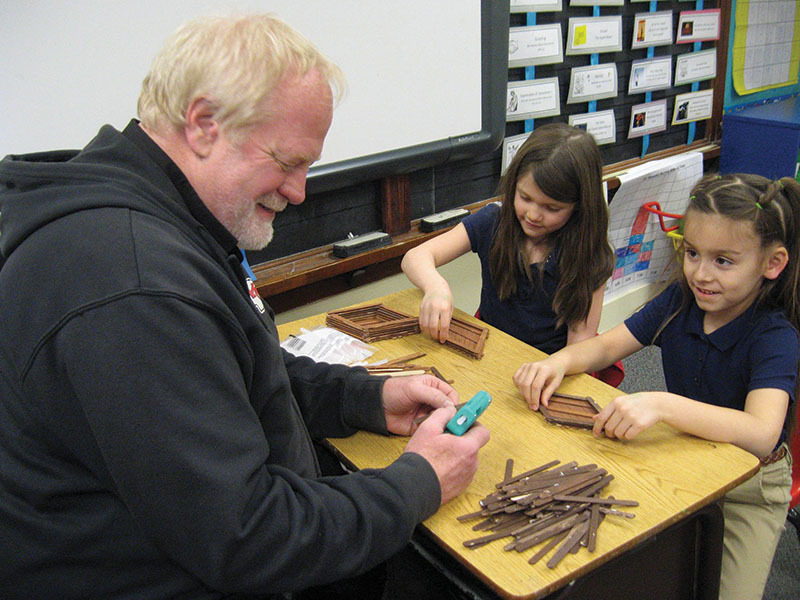 Father Pilcher also came to Totten’s classroom to help the students make Resurrection crosses. While helping them with their project, he asked them several questions so they could earn jewels for their crosses. “The students were very excited to have him in our room,” she said, adding that Father Pilcher then helped the students glue the jewels they earned onto their crosses. What does Father Pilcher like best about visiting the school? “Giving them a hard time,” he’s quick to respond. From the way the children greet him whenever they see him, it’s obvious his goal has been accomplished.